Thank you so much! Microsoft was useless but your fix worked! THank u so much .. its helped me lot .. Thank you! it works for me, I was bored by this for several days, really a good tips. Works great now! Thanks!!! Thought the issues was within Outlook, but it was Excel having the issues. Awesome, thanks so much, this was driving me crazy. a big THANK YOU, i tried so many other suggestions, non worked, yours worked first time. Thank you, Works great now! Thanks a lot... It works!!! it help, thanks alot. abit late to find this resolution. at least no more problem. Thank you! You helped me out alot! Thank you so much, it works!!!!! Thank you so much. Its works properly. Genius! Such an unhelpful (and wrong) message from Excel after downloading a .xlsx file from Google Docs. Fixed by simply unticking these boxes. Thank you. Saved my bacon, thought I'd lost a whole load of work but this technique enabled me to open the corrupt xlsx file. Thanks! I tried all the things but it didn't work. But after trying this i am able to open my attached excel sheet from Outlook 2010. Excel cannot open the file 'A.xlsx' because the file format or file extension is not valid. Verify that the file has not been corrupted and that the file extension matches the format of the file. Thanks man, it's working now. Uninstall TuneUp Utilities and this message could go away. Great!! it worked. Thank you. Please help me man i'm in deep shitt. It works. Thanks alot Alex. It works! Thank you so much! LIKE!!!! Did not work for me. Those options were already unchecked. I frequently get that error when trying to open a 2nd excel file when I already have one open. It's driving me crazy. I have lost so much productivity since "upgrading" to Excel 10. This is very strange. Do you get this message on the same files or randomly? On which drive are the files located - local or network drive? Thank you for the info! I will try to reproduce the issue and if succeed, I will add a notice to the article. my file as same problem if any problem with registry due to the virus? Sorry, I am not sure I can follow you. Could you please explain the problem in more detail? You have no idea how many hours of work you just saved me. Thank you thank you thank you! So, is the unfortunate lesson learned that you cannot convert all previously created files to Excel 2010? 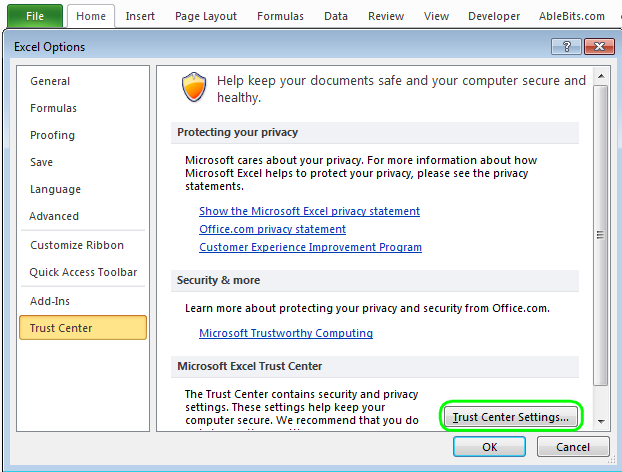 i see the location that you said, but in trust center i didnt see the protected view!!! Yes, the solution works for Excel 2013 as well. Microsoft made some improvements to version 2013 and such situations hardly occur. please guide me on this ASAP. You just saved my bacon mate! 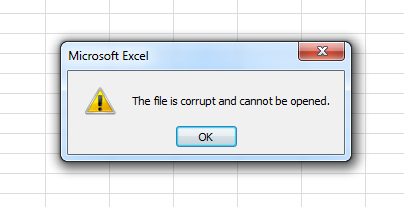 I couldnt understand why all my excel files were corrupt. Fortunately I have them all backed up, but its a chore to recover them all. Thanks for your solution this is working now.. Please note that Excel can’t automatically rename anything. The problem is likely in the way of opening files by some standalone program or add-in. This worked for excel 2013 as well. 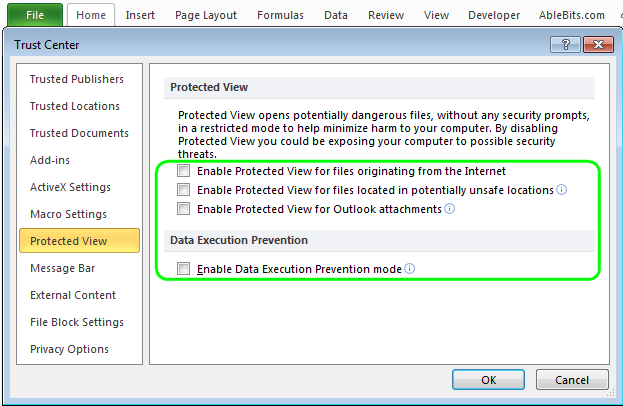 I faced the issue with all excel 2013, word 2013and PowerPoint 2013 while opening file from outlook. But can you explain why this happened suddenly after two years of using MS office 2013? Sorry, we can’t say why this happened. directly from the file list, but I still get the "corrupted file" message. For me, the issue was a photo image in the google spreadsheet. I tried a bunch of things that didn't work but by deleting the inserted image. The file would download as excel without the error message and can be emailed as attachment. Action item: If you have an image, delete it from the google doc and test it. superb, It is working now. Thank you very much friend. It works well. I did what you said. It doesn't work for me. I can't open any of my excel and word files. I didn't have any problems before until just this week. Now I can't open any of my files. I get a corrupted message. You might need to also update the "Trusted Locations" to include the file location. BTW, the warning still pops up for me, it is just that I can now elect to continue and the file opens.